If your website is not suitable for easy use on a mobile, i.e. it’s not ‘responsive’ or you do not have a version of the website just for mobile phone users, you will be affected by the Google update coming next week. Basically, if someone searches on their mobile phone, they won’t see your website in Google’s search results any more. However, if they search on their laptop or larger computer, they will see it as they do now. 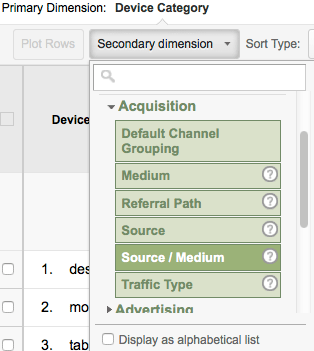 Login to Google Analytics and go to the report for your website. This shows you how many mobile users you have looking at the website. The screenshot above is for one of my personal websites, so the traffic generally is quite low. In this case, I had 102 visitors to the site using their mobile phone to view it in the last 30 days. Look down the list and find the line which says ‘mobile’ and ‘google / organic’. If it’s not immediately visible, try making the ‘show rows’ bigger in the drop down list under the table of results. So for this website, I had 61 visitors come through Google search to the website on their mobile phones in the last 30 days. This website isn’t built in a responsive way, so basically I’m likely to lose that after the Google update comes out. I don’t want to lose that, but then again, I’m also very busy at the moment and don’t have time to re-build the CSS and potentially the HTML of the website, so I’m just going to have to put up with that. It’s not great, but it’s 7% of my traffic. That’s not going to kill the website. Checking through my client’s websites, I’m seeing mobile use between 15% and 40%, and traffic from Google’s natural search results – remember, the bit that will actually be affected by this change – being between 2.5% – 13% and one outlier at 29%. If you’re a business and have Goals set up, it’s worth digging further in to Google Analytics to see how many visitors using their mobiles are converting in to customers – although this becomes tricky, as people often research on their phone, then buy on their computer. If you’re thinking of doing a quick conversion to a responsive website, check your Analytics first. If you’re only going to lose a small percentage of visitors, it will be worth considering not doing a hurried conversion, but holding off and giving it some more thought and doing a better update when you’ve had more time to work out what you want done. Yes, you’ll lose some traffic in the short term, but doing a hurried conversion that doesn’t work quite right won’t get you any more sales anyway. Don’t react just because the update is coming in now, improve your website by making it work better on phones because you want to give those visitors a good experience of your business. This entry was posted in Google Analytics and tagged google update, mobile, responsive design on April 17, 2015 by Paul Silver.